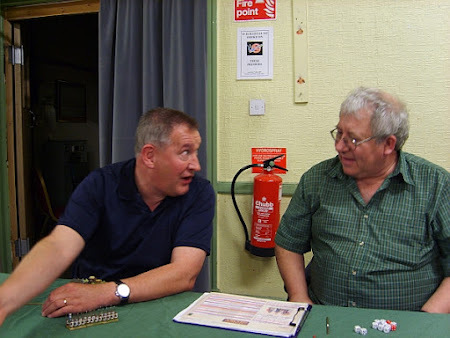 Graham & I took my Mongol Conquest army out for the day to the final round of the 2011 Northern League Field of Glory competition at Walkden.After our last outing I was anxious. Before the games we discussed how important it would be to at least compete. Having fielded class 2 & 3 armies earlier in the year, the Mongol army was a true Conquest army. Everything was superior and there were even some elite troops: a true class 1 army. It did however have one weakness: no shock troops. This means that it’s all down to shooting manoeuvre and spotting the decisive strike. We didn’t do too badly considering so let’s see what happened. Steve (Spike) Clarke & Martin Buxton fielded HYW English! As the picture above just about shows it was almost wall to wall bow armed foot; probably the worst opponent for a cavalry army. Plus the design of the army was very clever with an Inspired Commander and some heavy foot deployed as rear support. All this made it a lot easier for their battle groups to pass cohesion tests and therefore a lot harder to break. We had two chances during the game. The first on our left when we nearly routed one battle group but failed when it passed a post shooting cohesion test to remain fragmented and then passing a second test to rally from fragmented. Had this not happened our charge would have stood a good chance of breaking the unit and starting a cascade of routs in nearby units. This effectively ended our threat on the left. On the right we failed to bring our greater numbers too bear quickly enough and attacked in a somewhat piecemeal manner. Needless to say, we suffered continuous losses to bow fire throughout resulting in our eventual demise. 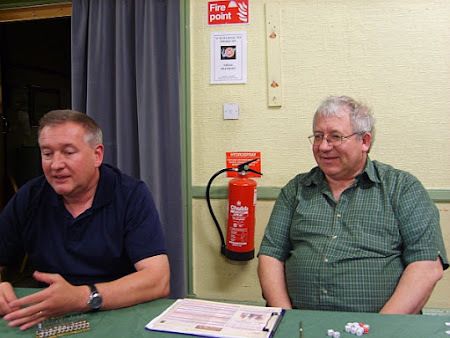 Graham and I played Dave Finnegan & Chris Proudfoot before in September 2010 when we were all learning FOG. As before they were great opponents although I was disappointed that Chris and retired his underpants. 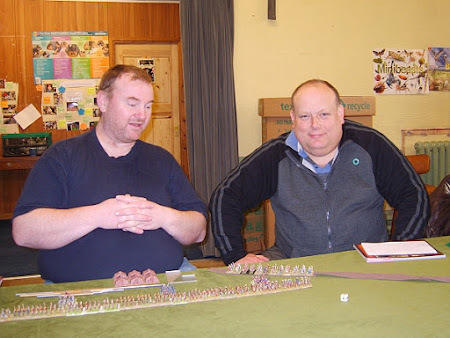 This time Dave & Chris fielded a Castilian army with Almughavars in an ally command. I didn’t note down whether this was the Feudal or Medieval version. All I know is they had lots of superior knights with some in battle groups of sixes. It would be fair to say that this game was far closer than the score suggests: we were two points away from breaking when we destroyed the final battle group to win the game. Dave & Chris got off to a really great start causing us no end of problems all along the line. Graham held the left and prevented a mass breakthrough but on the right I was struggling against the superior knights. However, after some Mongol losses the flexibility of the Mongol cavalry prevailed and Chris lost two battle groups of superior knights amongst others. Still Dave pressed on and we lost our camp to some medium foot and their medium foot crossbow reached our baseline before turning towards the flank. However, all the pressing cost Dave & Chris quite a few battle groups including the battle group that looted the camp! During the last few moves we were both two points (or one destroyed battle group) away from breaking. As the moves unfolded it became clear that Dave & Chris had but one realistic chance to break the Mongols: would a a knightly charge have enough reach to savage our light horse or make them flee off table? Bravely the Mongol light horse didn’t evade and Dave needed to roll a 6 to get the extended charge move and create havoc. Anything less would fall short and the Mongols would finish their frontal opponents. Dave didn’t throw a six and the Mongols completed their deadly work. Overall, an absorbing, and very close, game played in a great spirit. The frequent swings in fortune really added to the enjoyment and tension. In the end game the Castilians just didn’t have the right troops in the right place to chase down the Mongol units once the initial battle lines had fragmented. Phew!